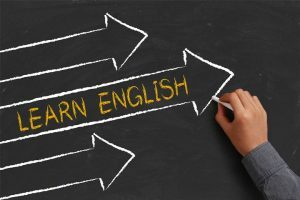 Many people living in MetroWest are working to learn/improve their English. If you read this blog often, you are probably one of them. Studying in a class can help you learn faster, but unfortunately there are not enough affordable classes in this area for everyone who wants to attend. However – right now is one of the best times of the year to find an English class. Almost all of the English programs in MetroWest are starting new classes in the next 4-6 weeks. Most have some spaces for new people. 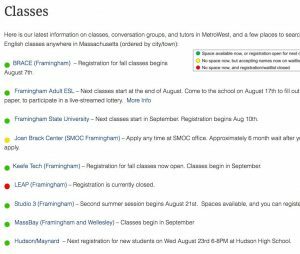 Look at our updated CLASSES PAGE. It lists many schools with English classes in MetroWest. All schools with a Green Dot – – have some spaces available for their next classes. Click/press on the name of the school for more information about the school – how to apply, costs, etc. If you live someplace else in the U.S. – it’s probably a good time to look for a new English class wherever you live. Looking on the website of your city/town, and asking at your public library is a good place to start. Do you like the words discount, and free ? Do you like the word enjoyable ? Reserve discount or free passes (tickets) for a farm, aquarium, boat ride, gardens, or museums at your local library. 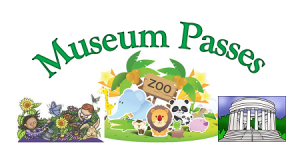 For example, Framingham has 12 passes – including the Franklin Park Zoo, New England Aquarium, Garden in the Woods (in Framingham), and the Children’s Museum. It’s a good deal. A trip to the Aquarium for a family of 4 would usually cost about $90. With the passes, the cost would be only $40! You need a library card to sign up for these passes. It’s easy to get a free library card. Just bring an I.D. (such as driver’s license) and an envelope or bill with your name and address on it to your library. 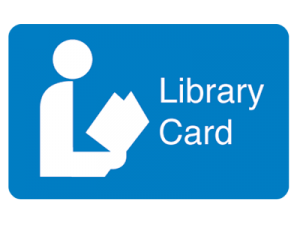 Once you have a library card, you can usually make a reservation for museum passes online.